Since my last message, we have continued to work on improving the Governance of the CAP and are well into phase two of the three-phase project. The Governance Committee has been established and templates for Terms of Reference, Policies, and Procedures are being prepared before rolling them out to the Board portfolios, committees, and divisions for completion. The Board has approved the establishment of a Student Council, which will have a direct reporting relationship to the Board (see call for student volunteers below). Also, the Chair of the CAP Advisory Council will now be elected from and by the members of the Council, thereby moving away from the President of the CAP chairing both the Advisory Council and the Board. These two specific changes are designed to try to ensure that the CAP gets broad input from, and is focused on meeting the needs of its members, no matter what stage of their career they are at, where they live, or in what field of physics they practice. As part of our ongoing effort to make the organization operate effectively, the Division of Industrial and Applied Physics (DIAP) and the Division of Instrumentation and Measurement Physics (DIMP) have been amalgamated to form the Division of Applied Physics and Instrumentation (DAPI)/Division de la physique appliquée et de l’instrumentation (DPAI) effective 2018 January 1. Please join me in wishing the new executive all the best in their future endeavors. We continue to make good progress improving benefits to our members and to the broader physics community with enhanced communication to you and by lobbying the Canadian government on your behalf. The CAP is the only national physics organization that will do this for you. These efforts are contingent on increasing our membership and thus our overall representation and reach. Many of the initiatives that we have put in place are not sustainable if we cannot meet our membership goals (see ‘Help us Reach 2020 by 2020’ below). I ask that every member encourage a colleague or student to join our association or to renew their membership if they have lapsed. Similarly, we need capable volunteers to help steer the association to greater achievements. I recognize too well how busy our members are but please share this link and visit https://www.cap.ca/about-us/cap-leadership/call-nominations-2017-2018/ to either nominate yourself or someone else to serve on one of the vacant Board and Council positions. Becoming involved on the Board or Council is a great opportunity to make a difference. Please act NOW. We need your involvement. Finance Minister Bill Morneau is inviting input into the 2018 Federal Budget. This is your chance to communicate how essential the need for funding for fundamental research is. Complete the survey at https://www.budget.gc.ca/2018/prebudget-prebudgetaire/index-en.html. Survey #2, Question B allows you to share the need for more funding for scientific research and the importance of independence for scientists and researchers to undertake fundamental research. The survey only takes a few minutes to complete. Let’s send a strong message from the scientific community. Please take a moment to do your part and share the link with your colleagues. The CAP, in conjunction with the CAP Foundation, has just mailed out the second in its series of High School Posters, entitled “Spot the Physicist”. 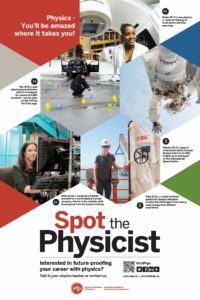 This mailing, like its predecessor, aims to reach physics teachers in the over 4000 high schools across Canada and provides the next step in a collaborative effort between the CAP and Physics Educators to encourage students to pursue a physics education. We encourage you to check out the new web pages, download the posters, watch the videos, and use these resources to help spread the word about the value of physics in the real world. Use these resources to support your next physics outreach event, or forward them to your outreach partners. Do you know someone with a physics degree who works in an exciting, non-academic career? Both the poster and video series are looking for people to profile in their next installments. Please have possible subjects contact us at execdir@cap.ca. The CAP Board of Directors and Advisory Council are committed to ensuring that the CAP operate under a governance structure that is focused on meeting the needs of its members, no matter what stage of their career they are at. Recognizing that our physics students at both the undergraduate and graduate level will eventually be the leaders of the CAP of tomorrow, we are taking steps now to create a means by which students will be more directly involved in the organization and help influence its future. Two immediate initiatives include establishing a mechanism that will facilitate networking amongst the physics clubs across Canada and establishing a CAP Student Council, the Chair of which will be directly involved in helping the CAP obtain the input of students as we embark upon updating our strategic plan for 2019-2023 in the Spring of 2018. We are looking for five or six student volunteers to work with our Director of Student Affairs as part of a working group to draft the Terms of Reference and Operating Policy for the CAP Student Council (mandate, size/structure, reporting line, procedure for membership and election of Chair, operating process, etc. ), with a view to having the Council established and the Chair (who will be invited to participate in meetings of the CAP Board of Directors) appointed by the end of February so that the Chair can participate in the strategic planning discussions to take place at the end of March or early April. If you are interested in participating on this Working Group, please send an e-mail – by 5 pm EDT on Friday January 8 – to the CAP Executive Director, execdir@cap.ca, outlining why you are interested as well as any previous experience you have that you believe would help you in this role. The CAP Office and Program Committee are actively preparing for the Call for Abstracts which will be issued around 2018 January 12. As reported in the 2017 October Bulletin, the Herzberg Public lecture will be given by Dr. Nergis Mavalvala from the Massachusetts Institute for Technology. Two of our four technical plenary session speakers have been secured: Dr. Juan Maldacena from Princeton University (invited by our Division of Theoretical Physics) and Dr. Anne Martel from the University of Toronto (invited by our Division of Physics in Medicine and Biology). Invitations have been extended to fill the remaining two slots and we look forward to announcing who these speakers will be at a later date. Division Chairs are actively working on their sessions and securing invited speakers and the Local Organizing Committee is engaged and providing much needed support for the local arrangements. They are also taking charge of the High School Teachers Workshop Day (Monday, June 11) as well as developing a series of lab tours to be offered during Congress. 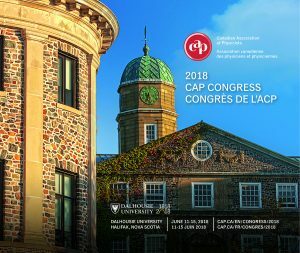 The list of confirmed invited speakers (as of January 3rd), as well as details regarding “Destination Halifax” and our block bookings with local hotels and on-campus residences, will be available on the Congress website at the time that the call for abstracts is issued. Stay tuned …. In line with our goal of increasing our number of affiliates and members to 2020 by the year 2020, the CAP organized its first national membership recruitment event on November 7, 2017, which also coincided with Marie Curie’s Birthday and the international day of Medical Physics. On November 7, all our members and affiliates were asked to increase awareness of the CAP within their immediate networks, targeting potential members, with emphasis on women in physics and medical physicists. Thanks to everyone, including our regional councillors and Friends of CAP who responded to our call. A special mention goes to TRIUMF and SNOLAB who helped to increase awareness of the CAP on their social media throughout the day. Through the combined efforts of all we were able to further increase awareness of the Association and its importance to the Canadian Physics community, as well as amplify our voice through the additional members that joined as a result of the event. Wishing all our members and affiliates a peaceful festive season with the hope that with your continued support, 2018 will bring us closer to 2020 members and affiliates! This year, the 53rd Canadian Undergraduate Physics Conference (CUPC) was hosted by Carleton University in the city of Ottawa. 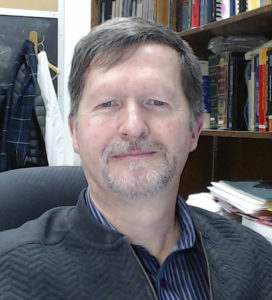 The CUPC is an annual event furthering Canadian research in physics by fostering connections amongst scholars and professionals from all over the country. Between the 20th and 24th of October, delegates met to share ideas, discuss research, and have some fun along the way. The conference kicked-off with an opening reception at the Canada War Museum, featuring appetizers and a live string quartet performance. Over the weekend and into Monday, undergraduate students delivered oral and poster presentations explaining research in the fields of particle physics, solid state physics, cosmology and engineering physics to fellow students. Each presentation was followed by a brief question period where fellow students were given the chance to ask for clarification, suggest areas for improvement, and comment on the material presented. To incentivize a healthy level of competition, top presentations were voted upon by CUPC judges, and awards were distributed at the closing banquet. The CAP awarded the prize for best overall oral presentation and the CAP Committee to Encourage Women in Physics awarded a prize for the best overall poster by a woman. In addition to student presentations a career panel, and tours of various Carleton University research facilities were provided to delegates. Students were also given the opportunity to further build upon both peer-to-peer and academic connections in a graduate studies fair, which saw the participation of several universities. The conference also featured a total of three keynote speakers: David Sinclair provided an inside look at SNOLAB and brought delegates up to speed with the latest research in the detection of neutrinos at SNOLAB; Sangeeta Murugkar gave a fascinating lecture on the history of and developments within the field of optical medical imaging; and finally, renowned physicist and Carleton alumnus Lawrence Krauss, discussed quantum fluctuations and the detection of gravitational waves. Coinciding with Canada’s 150th anniversary and 75th anniversary of Carleton University, this year’s conference was the largest CUPC to date! The next CUPC will be hosted by the University of Alberta, during summer of 2018. Calling all Graduate and 4th year undergraduate physics students. National 2018 Professional Practice Examination (PPE) will be written on January 23, 2018. The date for writing the Professional Practice Examination (PPE) has been set for TUESDAY, JANUARY 23, 2018. Fourth year undergraduate students and graduate students may write the three-hour exam. While the exam is not offered to third year undergraduate students, they can write the exam for practice purposes only at the discretion of the host university. There is no fee for the PPE; however, students must be CAP members to write the PPE. It is mandatory that their membership be up-to-date prior to the exam. Membership in the CAP is free for undergraduate students and graduate students receive their first year of member free, after which reduced membership fees apply. Once students have passed the PPE and met all other necessary requirements, they can apply for their Professional Physicists (P.Phys.) designation. It strengthens the professional profile and employability of Canadian Physicists and signifies an ability to work at a professional level in a professional capacity. NSERC Calls for submissions for “Science Exposed”. Showcasing science through vibrant images. Entrants with a physics submission are encouraged to also consider submitting their entry in the Art of Physics competition run by the Canadian Association of Physicists (see https://www.cap.ca/programs/art-physics/). UCNs like those produced at TRIUMF move slow enough and with such low energy that they can be trapped and contained inside special bottles. This makes UCNs ideal for a variety of important fundamental physics measurements, including determining the neutron electric dipole moment (the nEDM). Scientists predict the nEDM to be vanishingly small- however, if it is measured to be larger than expected, it could aid in solving the puzzle of why there is much more matter than antimatter in the universe! As Canada’s particle accelerator centre, TRIUMF has been pushing the boundaries of particle and nuclear physics and isotope research for nearly five decades. Next year marks TRIUMF’s 50th birthday, and preparations are underway for a year of celebration and recognition as the lab fondly reflects on its five decades of adventures in science and looks ahead to a future filled with excitement. TRIUMF is seeking input from its diverse community of colleagues and alumni from across Canada and around the world: if you have a TRIUMF memory that you’d like to share or celebrate, or to learn how you can join in the lab’s festivities, please see http://www.triumf.ca/50th-anniversary. Stay tuned for news and upcoming events! The first issue of 2018 will be a theme issue on Neutron Scattering Research in Canada which is scheduled to go out to members/subscribers by the end of March 2018. The papers in this issue will provide a brief history of the NRU and the pending NRU reactor closure. The Guest editors for this issue are Daniel Banks (CNBC) and Young-June Kim (U. Toronto).